The Handlebards are cycling actors who carry all the set, props and costume needed to perform extremely energetic, charmingly chaotic and environmentally sustainable Shakespeare plays across the globe. They specialise in outdoor theatre, as they love performing in the open air, but really, theyre happy performing almost anywhere. In Summer 2019, both the all-female troupe and all-male troupe are cycling across the UK bringing a unique brand of Shakespeare to all corners of the country, before touring internationally. 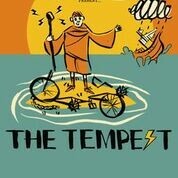 The all-female troupe are touring with The Tempest, whilst the all-male troupe are performing Much Ado About Nothing. Join the all-female troupe for a riotous bicycle powered production, filled with magic, musicality and Shakespearean mayhem. Tickets are at a special early bird price for a limited period so book early!